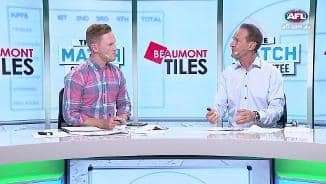 Goodwin delighted with Spargo and co.
Melbourne's big third quarter of seven goals to one, including six goals from Intercept Possessions was the key to their big win today. 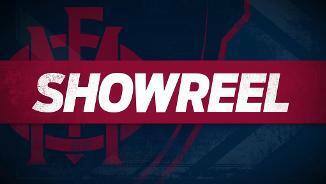 Nathan Jones 24 disposals, nine clearances and seven inside 50's made him best on ground. Michael Hibberd's 584 metres gained is a new season record for the Demons, surpassing Christian Salem's 519 metres gained last round against Hawthorn. Neville Jetta has been outstanding for the Demons today. He has 12 Intercept Possessions including five Intercept Marks to lead all players on the ground, and the Demons have scored three goals from his Intercept Possessions. Jake Stringer gets his third goal in an efficient outing today. He only has nine disposals but leads all Bombers with five marks inside forward 50 and three contested marks. Melbourne have outworked the Bombers in the second half of this match. They have recorded 11 more disposals and seven more tackles, as well as gaining 700 more metres of territory and kicking nine goals to two from Intercept Possessions. Zach Merrett has been terrific for the Bombers. He has a teamhigh 28 disposals, 10 tackles, six inside 50's, seven intercept possessions to go with 23 pressure acts and 375 metres gained and the clearance to launch the last goal to the Bombers. The short recovery time from Anzac Day is starting to show in Essendon's performance. They have a kicking efficiency of 54 per cent in the final term, compared to 82 per cent for the Demons off one extra day's rest. Christian Salem has started well in the final term. He has recorded five disposals from two contested possessions as well as the score launch for the first goal of the quarter to Mitch Hannan. Max Gawn has set a new season record with 10 hitoutsto-advantage in the third quarter. The previous best record was eight held by Ben McEvoy from the second quarter of his Round 2 clash with Geelong. Michael Hurley kept Essendon in the game in the third term. He recorded seven disposals, three Intercept Possessions including two Intercept Marks to lead all Bombers in each category in the third quarter. Nathan Jones was terrific for the Demons in the third quarter. He lead all players on the ground with nine disposals, 200 metres gained, six contested possessions, four clearances and five score involvements. Demons InterchangeCharlie Spargo off due to an injury. Max Gawn now has his first multiplegoal game since Round 17, 2016 against St Kilda, a six-goal loss at Etihad Stadium. Jake Stringer gets a goal to stop the run of seven goals for the Demons. Stringer's goal was just the second goal from 22 forward half Intercept Possessions for the Bombers in today's match. 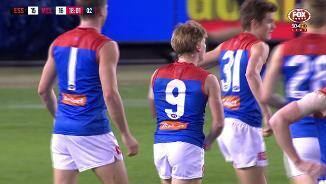 The Demons have four goals from 19 Intercept Possessions. Zach Merrett has recorded five tackles in the first half of this quarter. No other player has recorded more than two tackles this quarter. He also leads all players this quarter with 113 metres gained, eight pressure acts and two inside 50's. That makes it six goals in a row for the Demons since the 17 minute mark of the second term, all of which have come from set shots at goal and all of which have been launched from Intercept Possessions. Jake Melksham has three goal assists in this time. Both of Melbourne's goals early in this term have been launched from midfield Intercept Possessions. They average four goals per game from this source, the equalthird lowest average of any side in the competition in 2018. Jesse Hogan gets off to the perfect start with a goal to tie the scores up early in the term after winning a 50 metre penalty. This is Melbourne's second goal from a 50 metre penalty in 2018. Matthew Leuenberger has matched up well against Max Gawn in today's match, his first for 2018. He has 13 disposals, eight disposals and three inside 50's, outperforming his direct opponent in each category. They also both have four score launches. 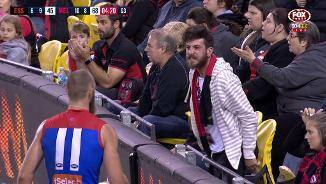 Michael Hibberd looks to have rediscovered some of his 2017 form. He leads all players with 303 metres gained in the first half, the most metres gained in any first half he's played since Round 19, 2017 against the Kangaroos. Both teams have scored 2.5.17 from set shots in the first half. This is the secondlowest first half points total from set shots for both teams in 2018. The two former GWS Giants Academy members making their debut's today have had a good first half of AFL football. Kobe Mutch has 12 disposals and five marks, and Charlie Spargo has 10 disposals, three marks and two goals. Andrew McGrath has recorded 19 disposals in the first half for the first time in his career. His previous best of 16 disposals in a first half was recorded against Adelaide in Round 1 this year. Essendon have recorded 11 spoils in marking contests to the Demons five. Patrick Ambrose leads all players with four spoils, all on Jesse Hogan who has just two marks and three disposals in the first half. All three goals for Essendon this quarter have been launched from defensive half Intercept Possessions. The Bombers average four goals per game from this source, the fifthhighest average of any side in the competition. Tom McDonald has found his feet very quickly in his first match back from injury. He has six Intercept Possessions including two Intercept Marks, both gamehighs. After the teams shared 24 inside 50's for three goals in the first term, they have shared three goals from six combined inside 50 entries early in this quarter. Charlie Spargo gets the first goal of his career as a result of the Demons locking the ball in their forward half since the opening bounce. The Demons have recorded six tackles to one and have won all three clearances in the second term. Melbourne's one goal for the first term came from general play through Mitch Hannan. They average two goals a game from general play, the secondlowest average of any side in the AFL this season. David Zaharakis was outstanding for the Bombers in the first quarter. He recorded 10 disposals at 100 per cent efficiency, seven pressure acts, four score involvements, three tackles, two inside 50's and two score assists, all of which were teamhighs. 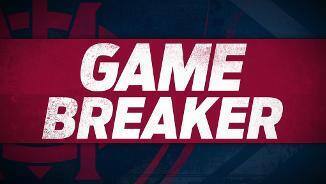 Melbourne have won three of their four defensive oneon-one contests in the first quarter. They average a win rate of 36 per cent from defensive contests in 2018, the second-highest win rate in the competition. Christian Salem has been important for the Demons in the first term. He leads all Melbourne players with nine disposals, five contested possessions to go with four pressure acts and the possession gain that launched Mitch Hannan's goal. Four of Max Gawn's five hitout's in the first term have been to the advantage of the Demons midfielders. Only Ben McEvoy and Brodie Grundy have a higher hitoutto-advantage percentage in 2018 than Gawn (31 per cent). 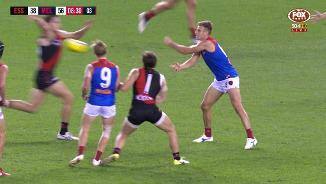 After six inside 50's, Essendon finally breakthrough as Devon Smith gets the first goal of the match. The Bombers average a goal from 25 per cent of inside 50's, the sixthhighest scoring rate in the AFL this season. Essendon are already dominating the uncontested football, as they lead the Demons 3414 uncontested possessions and 9-4 uncontested marks. Essendon are ranked seventh in the AFL in both these categories in 2018. The last time these two sides played was in Round 6, 2017 at Etihad Stadium. Melbourne won that match by 38 points and Tom McDonald, who returns for his first game of 2018, was awarded three Brownlow votes for his 26 disposals, 12 marks and one goal. 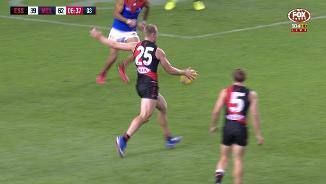 From the top 50 players for kicks inside 50 in 2018, 29 per cent of Dyson Heppell's kicks result in a mark (equal fifthbest percentage) and 26 per cent of Joe Daniher's kicks result in a mark (equal eighth-best percentage). Among the top 20 players in the AFL for turnovers forced in 2018 James Harmes (27 per cent), Christian Salem (23 per cent) and Christian Petracca (17 per cent) have the threehighest scoring percentages. Petracca misses today's game with an injured hand. Melbourne average plus 11 minutes time in forward half this season, the highest differential of any side in the AFL. This can be attributed to their 91 per cent kick forward and 46 per cent kick long ratio, both the highest ratio's for any side in 2018. Essendon have launched 6.1.37 from kickin's in the 2018 season, the most points of any side in the competition from this source. 45 per cent of their total points scored have been launched from their defensive half, the highest percentage of any side. Welcome to Etihad Stadium for the Essendon v Melbourne Round 6 clash. IT WAS the 'untippable' game. 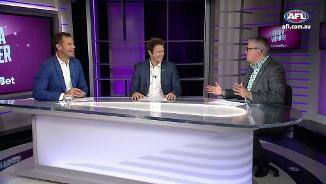 The competition's two most untrustworthy and inconsistent sides pitted against each other following big defeats last week. Throw in short Anzac Day-related breaks, and picking the winner of Essendon and Melbourne was like predicting Victoria's weather. 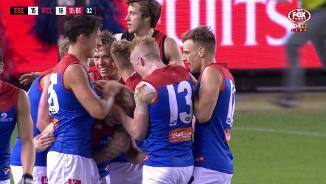 But after seven goals to one in the third term for the Dees, it was clear your tip would be true with the red and the blue as Melbourne went on to comfortably defeat Essendon by 36 points at Etihad Stadium on Sunday. The odds might have been even coming into the contest, but the game was far from it. The 16.12 (108) to 10.12 (72) win was Melbourne's third of the season and comes after last week's belting to Richmond. There was nothing fancy about it, however it should provide some confidence after a challenging start to their 2018 campaign. 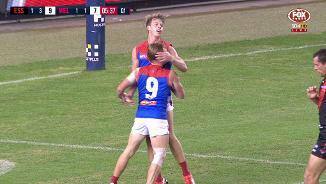 Their forwards – including Bayley Fritsch, Charlie Spargo and Mitch Hannan, who combined for eight goals – were too lively for a lacklustre Essendon defence, while midfielders Nathan Jones, Angus Brayshaw and James Harmes were also impactful as Max Gawn ran riot in the ruck and near goal in a commanding display. "Our second half resembled the way we want to play. 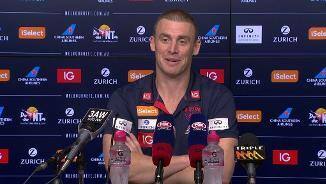 Our hunt and our pressure and our contested work and clearance work came back and we obviously started to connect better with the ball," Melbourne coach Simon Goodwin said. "That made a massive difference to us in the end. We acknowledge that Essendon had to come off a four-day break, but it was a step in the right direction for us last week and I thought today we carried that through." The positives were harder to find for the Bombers, who have slumped to 2-4 after six rounds and will need to find form quickly before their season, and finals hopes, evaporate. In another sluggish showing that came four days after their Anzac Day shocker against Collingwood, the Bombers conceded 12 goals in the second half and managed just five in an effort that will raise more questions about their midfield and underperforming forward line, with Joe Daniher held goalless. 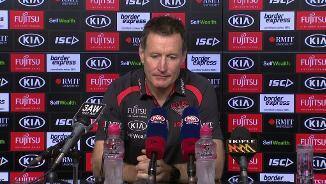 Coach John Worsfold lamented his side's costly third term. "We didn't play the perfect game in the first half, but it was on. But the third quarter we turned the ball over, dropped marks, fumbling … everything was well below what we'd shown earlier in the game," he said. The Demons didn't have control throughout, though. It took 11 minutes for the game's first goal, as Devon Smith strolled in to boot one for the Bombers, but there were only two more for the term as the out-of-form sides battled hard to get on top. It was Essendon with the early ascendancy, as the Bombers held a six-point lead at the first break, but ut neither team looked set to break out of early-season malaise with a burst of goals and glory. The second quarter didn't reveal any signs of that being forthcoming either. Essendon began to move the ball with more fluency out of their backline, and stung the Demons a couple of times with players free in attack to get out to a 16-point break midway through the term. But sparked by debutant Spargo, who kicked two classy goals for the quarter and provided some bite near goal, the Demons clawed their way back to be six points down at the main break. Skill errors more than scintillating moments will stick in the mind, however, with the first half drowning in missed kicks, wayward handballs, dropped marks and a couple of out-on-the-fulls for good measure. 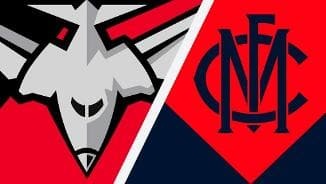 Melbourne found its feet after the main change, booting the first four goals of the third quarter in the opening 10 minutes to streak ahead by 18 points. It meant the Demons had kicked six goals in a row as the Bombers started to tire and be beaten to the ball. Gawn, who pushed forward more to exploit Essendon opponent Matthew Leuenberger, kicked two checkside goals from the pocket for the quarter in a dominant display and when former Bomber Jake Melksham followed that with his own major, the Demons had been able to build a match-winning 31-point advantage at the last change that wouldn't be headed. Essendon: The Bombers appeared to get through the contest without any major injury concerns. 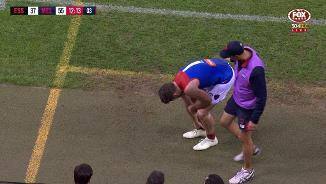 Melbourne: Star Demon Jesse Hogan limped from the field in the third term with a right knee issue and headed straight to the changerooms for assistance. He returned a little later in the quarter and played out the game. The Demons are back at Etihad Stadium next Sunday when they tackle St Kilda, while Essendon faces Hawthorn at the MCG on Saturday.